I've gotta say, I love glitches, and when they're in a creation game like Super Mario Maker, they're even more fun since they can often be used as tools for cool level design. ...or they may be used for evil, troll-y level design. So whether you're looking for inspiration or giving yourself the tools to avoid being trolled, here's the place to look! I'm compiling a list of every known glitch in Super Mario Maker and organizing them all here. This post is no longer up to date. I'll remove this message when it is. But keep in mind that levels now retain the version that they were made in so in most cases, a glitch that is patched will still work in levels that were made before the patch. 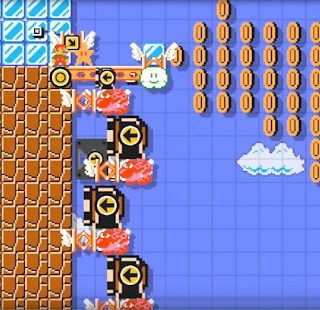 - Spring and Note Block Clipping: By placing a bunch of note blocks and/or springs next to each other and against a ceiling or other object in certain ways, it is possible to cause Mario or an enemy to clip through various barriers. - Donut Thwomp Push [Fixed in v. 1.20 for thwomps only]: A thwomp with space below it will be pushed up a little bit when a falling donut block passes through from above. If repeated enough times, the thwomp can be pushed upward through one-way platforms. If used to push the thwomp through solid blocks, it will move only a few pixels and then stop. Nonexistinghero notes that the same effect can be achieved with wall-mounted cannons (still works in v. 1.3). - Conveyor Mole Projectile Glitch [Fixed in v. 1.3 for any future levels]: Place a mole on a conveyor belt and then stack a large projectile throwing enemy (Bowser or fat Hammer Bro) on top of it. Over time, the enemy's projectile speed will increase to insane speeds. If you wait long enough, Bowser will clip through the wall. The same effect can be achieved without the conveyor belt if using a big Bowser. Also, after around 25 seconds, there is a chance that Bowser will die upon pressing a P-switch (or when the effect wears off) if the wall he is pressed against is blocks (as opposed to a one-way wall). - Wall jumping in SMB1, 3, and World [Works as of v. 1.21]: Run and jump off of a moving platform (skulls) while ducking, then with perfect timing and positioning, jump upon hitting a vertical wall. If done correctly, you'll be able to jump. - Clown Car + One-Way Block Ceiling Clip [Works as of v. 1.3]: By positioning a clown car on a one-way wall, you can jump slightly from the wall-side and stand on top of one of the one-way wall objects. Once in this position, it's possible to jump upward and clip into a ceiling above. 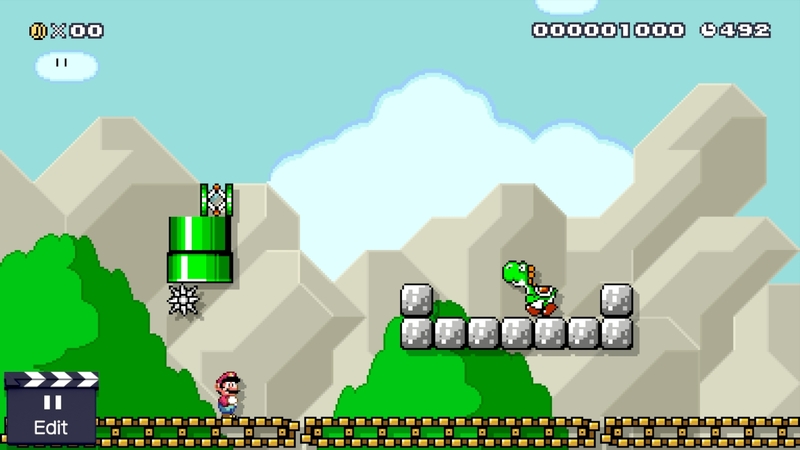 In a Super Mario World or New Super Mario Bros. themed level, place a spike block just outside of a pipe. Upon exiting the pipe while riding Yoshi, the spike will knock you off Yoshi and into a frozen, 1.5-block tall state. - Rail-Glitching Blocks (Putting two blocks on the same tile) [Fixed in v 1.20 - Levels made using this glitch will be played as if only one block is in a tile and the glitch can no longer be performed]: This is the glitch that is used to make invisible platforms, fake platforms (which you fall through), and any other "weird block glitch" which combines the attributes of two blocks into one. Working with this glitch is complex, so I recommend checking out the guide on /r/MarioMaker for all the helpful details. I wouldn't be able to write it better than they already have. In general though, put a block on a track, drag the track on top of another block, then use the track tool to remove the track, leaving both blocks on the same tile. To see the basics of how to do it in the editor, check out this video by GameXplain. Mysterio64 has also made a reference chart to help you understand the results of each block combination. - Cannon sliding [Works as of v. 1.3]: Cannons placed on walls can be pushed up a little bit at a time by throwing objects up at them (easiest in Super Mario World style) or by using trampolines. It will keep going until it stops at a ceiling or, if there is no ceiling, it detaches and falls down. (Found by genotaru) Cannons can also be pushed up when a falling donut block passes through them from above. If you know of any additional glitches that aren't on this list, let me know and I'll add them! 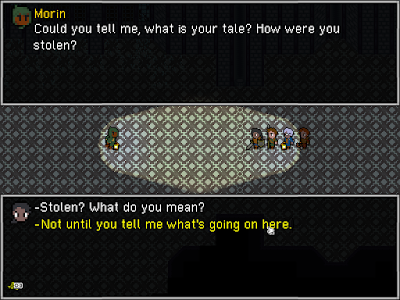 I'll be honest, I haven't played many strategy RPGs and I've enjoyed even fewer; it just isn't my favorite genre. 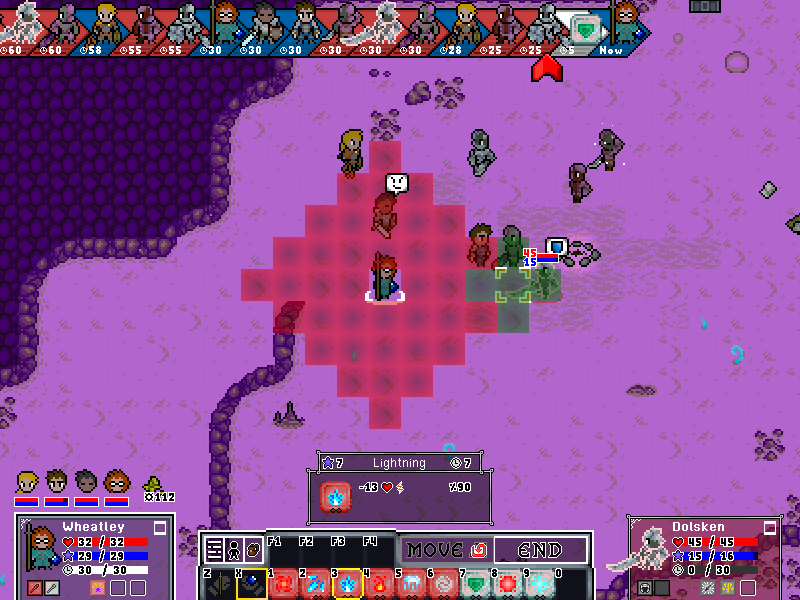 And yet, thanks to its focus on exploration, unique setting, and multitude of methods to success, I very much enjoyed Voidspire Tactics. So while I may not be able to compare it to other tactics games for you, I can tell you what the game is and let you make your own conclusions. And honestly, that's how I always try to review games anyway. Voidspire Tactics starts out with you designing and naming your four voiceless (apart from what's said via dialogue options) heroes and choosing from four different races and a variety of appearances. Each race has a small advantage in some area, but you're probably better off with a variety on your first time playing. It's cool to note that each race is decidedly different from typical fantasy-style games (no elves or dwarves); instead there are feathered lamias, faceless people who wear masks, and cat-people. The world itself also doesn't follow many of the typical clichés and reminds me of Cave Story in a lot of ways (probably because of the similarly whimsical writing style and the floating island bit). I won't go too much into the game's story to avoid spoilers, but the gist is that early on, you and the chunk of land you're on get warped somewhere and you have to figure out why. Since you control largely voiceless protagonists, it's up to you to decide how you interact with other characters along the way, whether aggressively or with friendly curiosity. Honestly though, while you can avoid certain battles based on your choices (you often can choose to negotiate, fight, or bribe potential enemies), very few of the choices in cutscenes relevant to the story actually change anything. There isn't really that much twisting and turning in the story either and, though unique, it's pretty straightforward through most of the game. That said, there is a lot of optional backstory accessible through certain NPCs, books, and the fact that you can examine almost every object in the game to see a written journal entry about it. So while the actual plot isn't anything mindblowingly great, it's unique and well-written enough to be enjoyable. Honestly my biggest complaint about the plot was that the ending felt a bit short and unsatisfying, but then again, I don't know what else I would've asked for from it either. Here, I recorded some gameplay footage for you. Now onto what you really care about: the gameplay. Basically, it all comes down to exploration and combat. Exploration is kind of like Zelda, not so much in the "get items to get to new places" way, although there is some of that, but more like how you can pretty much go wherever you want from a top-down perspective and uncover a ton of optional secret items, areas, and challenging optional bosses. I can't emphasize enough how many secrets there are in this game and how they aren't as painfully obvious as most secrets in games these days. Since there are so many secrets, and because they are often hard to find, you're bound to find some of them and feel especially good about yourself while doing it. Even after playing through the game multiple times, I'm sure that there are secret areas that eluded me. What makes the exploration so compelling is that you can use all of your items, attacks, and magic outside of battle in the same way as during battles. This lets you interact with the world in a lot of interesting ways. For example: Use fire to burn bushes or bridges, use ice magic to freeze shallow water, use regen magic on vine seeds to make an impromptu ladder, or use a pickaxe to actually dig through nearly any wall, ropes to climb down any cliff, and shovels to dig up buried items. This freedom in exploration is probably my favorite thing about the game and I couldn't get enough of trying to get places in unintended ways, only to find that the game had been designed with my clever method in mind. Although it's difficult, with enough planning and clever maneuvering, it's probably possible to beat nearly all of the game without killing an enemy. And don't worry about missing out on XP for leveling up; there are hidden XP-granting items all over the place to reward your exploration, and even avoiding battles through negotiation grants XP. As for the combat, this ain't no RPG Maker game. Voidspire Tactics was made on an original engine which was previously used in the developer's other (free) game, Depths of Boatmurdered. But though the game engine is technically the same, it's been updated a lot and is used in a totally different way to achieve that strategy RPG gameplay you know and love. The battles take place right in the overworld, with no transition to a "battle screen". As such, you're able to buff yourself up and make a plan of attack when approaching potential enemies. 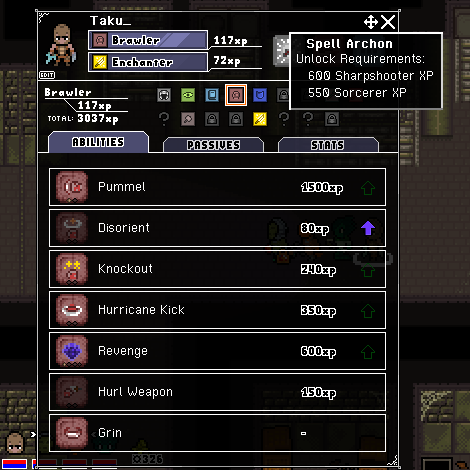 Once spotted by enemies or whatever else triggers the battle, the game transitions to a turn-based combat mode where each character takes turns moving and acting (attacking/picking up weapons/using an item, etc.). Depending on your character's stats and equipment, you'll be able to move further, attack harder and more frequently, and defend better. The interesting stuff comes with character customization though, because you're able to assign a class and sub-class for each character, level each class up, and switch at any time. Experience earned while a certain class is in use can be distributed to unlock special attacks and other useful techniques or passive abilities, the latter of which can be in use even when that particular class isn't being used. In addition to the regular experience points, you'll also get stars for each class which can be used on permanent stat upgrades. To begin with, only three classes are available, but once you reach certain mastery levels with certain classes, more are unlocked. There's a whole lot of potential for cool character builds since you can use techniques from any two classes and three passive abilities from any combination of classes. 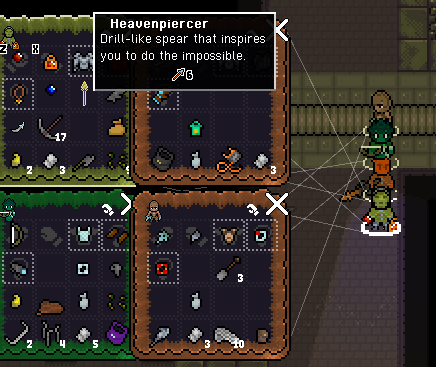 Furthermore, there's a crafting system so that you can make weapons with cool effects by combining material items you find while exploring with crafting blueprints. You can't really customize and upgrade items too much, but there are a fair bit of cool weapons and armors that can be made and found. Here are the moves unique to the Brawler class. Also, you can see what mastery levels you need to unlock the Spell Archon. Another common element from tactics games that often put me off personally is permadeath of characters. Voidspire Tactics strikes a middle ground with permadeath by allowing a method of bringing back "lost" party members that can only really be done once you are outside of the current area. Most people probably won't even have to do that, however, because the saving system is extremely generous. You can't save during a battle, but you can easily save multiple files anywhere else and quickly reload if something goes wrong. Fans of permanent consequences might be bummed about this, but those who like to experiment without fear of screwing things up will probably love it. Admittedly, the ability to save anywhere is almost unfairly handy at points, since you can potentially save just before a battle and keep reloading until you get lucky with a low-accuracy, but powerful, pre-emptive strike. As for the technical details... Voidspire Tactics is not demanding on resources and should run on most computers. The graphics are certainly the game's weakest point and are pretty much in ye olde 32-bit style with some modern lighting effects thrown in. They're not bad, but they're not particularly unique or memorable either. I also had an issue with flickering seams between certain background tiles, but was able to fix this by changing the settings on my graphic card for the game. (Set Negative LOD Bias to "Clamp".) Both windowed (resizable) and full-screen modes are supported, as well as a color-adjusted color blind mode. The controls are remappable, but controllers aren't natively supported at this point. In general, the game uses a combination of mouse and keyboard, since you need the mouse to drag objects into your inventory or to another place. Because of that, it'd be pretty hard to map your own controller to use with this game unless you can emulate a mouse well. I also feel the need to note that, while uncommon, I did encounter a few seemingly random crashes, but since the game auto-saves whenever you enter a new area, it never cost me much progress at all. 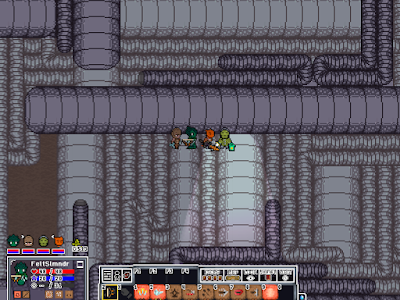 The art direction might not be so great overall, but I thought this wormy area was pretty cool. They actually wiggle! Oh yeah, the music! It's good. It's royalty-free music, but I hadn't heard any of it before and it really rocks. It's like a mix of retro and new, so, yeah, I liked it a lot. Oh yeah (part 2)! The game takes about 10 to 12 hours to beat, depending on how much you explore and if you get stuck, but with the few post-game unlockables and potential for speedrunning, I could see people wanting to do multiple playthroughs. Even without being a fan of the genre, I really enjoyed Voidspire Tactics because of the variety of ways that you can explore the world and win each battle. There are rewards for exploring around every corner and perfectly challenging battles for both noobs and veterans. The graphics and art direction aren't really anything special, but if you can look past that, there's a gem of a game here that's absolutely worth playing. Disclaimer: The author of this review was one of the beta testers for Voidspire Tactics and knows the developer personally, but is pretty sure this hasn't clouded his judgement or biased the review in any way. Perhaps you'd also be interested in checking out this other game by the same developer or something totally different.